“I don’t think I’ve ever been to Glasgow when it’s not been raining”, said my daughter on Sunday. She’s 32 and has visited the city many times since childhood. I’m sure she’s mistaken, has taken an average experience to be an absolute one, has learned the skill of hyperbole, or else been very, very unlucky. I had a sinking feeling that the many times I’d packed her off, a brave little unaccompanied minor on an early flight from London to spend half-term with my mother, were imprinted on her memory as miserable, wet episodes. “Dreich”, my mother would have said. Though that would not have deterred them from venturing out to some museum or other. I think she’s been to more of those than me. And me a Glasgow girl. Sunday, then, was possibly the first time her eyes were opened to the outdoor splendours of this grand city. For it was a cracking day. One of those late autumn days when every view would have made a perfect screensaver. Rose-gold light bounced off pale golden buildings. Cool, almost brittle air. The kind of luminosity that eludes other seasons. We spent the day pacing the streets of the Merchant City. She doesn’t know the city but she’s deft with Google Maps, so we wove a meandering path through the centre exploring this and that: we heard a man play the piano at the top of Rennie Macintosh’s Lighthouse; walked under the arch behind the City Chambers; peered into the old City Halls in Candleriggs; ate lunch at Cafe Gandolfo. Arbroath Smokies with an Italian twist for her; hot-smoked trout with a tattie scone for me. Every street seemed to lead to another building on a monumental scale. The Merchant City was built big, built to impress and endure. It seemed new to me yet familiar too. Perhaps I’d forgotten how wide the streets are, how grandiose the buildings. Did I visit these places before or just know of them? How is it that you can spend years living in a city yet see very little of it? A short walk east and you’re in the Barras Market, an institution in the city and a symbol of the class divide. I’ve never been here but I ‘know’ it. Gritty, cluttered streets full of cast-off clothing, old crockery, dilapidated furniture, bits of jewellery, typewriters, record players. We browsed and chuckled at the gaudy dresses, the grubby cut glass, the chair with hands coming out of the sides. Spend long enough and you may find treasures. But this is a different world. And I had a sense of being a visitor in my home town. 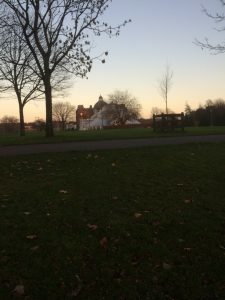 Walk south towards the river and you’re soon on Glasgow Green, a lovely expanse of grass and trees where the People’s Palace, another stout, imposing building, tells the story of Glasgow society. The grim housing, the poverty. It was a story that made me sad for it seemed to play so much on the darker stereotypes of the city’s folk – the criminals, the drinkers. Or maybe I heard the echoes of stories I was told about people I never knew. Back out in the fading light we walked down to the river. I’m on familiar ground again. The Clyde looks like it always did, serious, steely, indestructible.